Class of 1969 is planning ahead for their big 50th reunion! SAVE THIS DATE!! 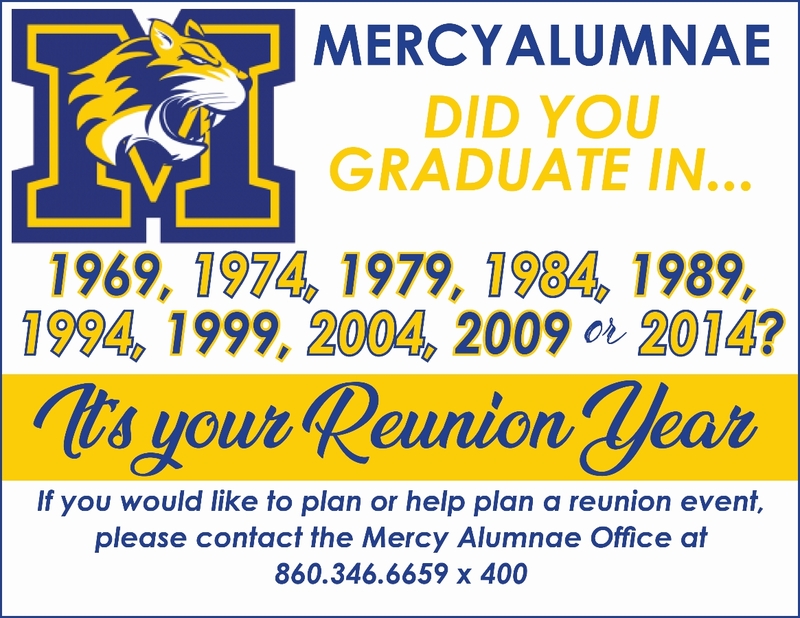 Saturday, October 19 is the 50th Reunion of Mercy’s Class of 1969. A volunteer committee has been working on this celebration for more than a year. Please consider joining your classmates for this momentous anniversary of our graduation from Mercy High School. We are planning a special day. We are hoping for a mass and tours of Mercy in the afternoon and then a move to Violi’s at the Hunter Golf Club in Meriden. The evening will begin with cash bar social hour with light hors d’oeuvres and a sit-down dinner, memorabilia and a multitude of shared stories. GUESTS are very welcome to attend and the facilities are handicap accessible. So, how about it? Enjoy the color -- colorful vistas of fall in CT and the colorful personalities we’ve all grown into over 50 years. We will send out a printed invitation with RSVP and payment information closer to the date. For now, if you have moved or think the Alumnae Office might not have your mailing address, please respond to this email with your current information. The committee is excited. We hope you are, too. God bless and good health to all! Members of the Class of 1973 gathered at Mercy on Saturday, November 9, 2013 for a student led tour of the school and shopping at the Book Store to pick up some new Mercy attire! They moved on to Esca Restaurant for a fun 40 year reunion, catching up on each others lives and making new memories. Mercy and Xavier held a joint 25 year reunion on Saturday, October 19, 2013 at The Gelston House Restaurant. Laughter and memories were shared all night long!